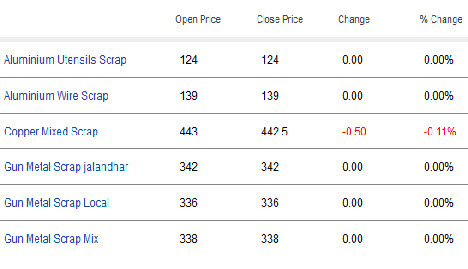 In Mumbai Metal market, Copper and Aluminum witnessed a negative trend today. 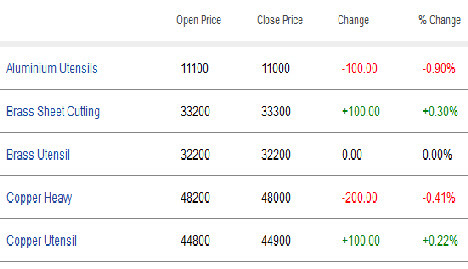 In Mumbai Metal market, Copper and Aluminum witnessed a negative trend today. Copper Heavy – Scrap prices dipped to Rs 48000/100 kg i.e down by Rs 200.00/100 kg from last trade price. However prices of Aluminium Utensils scrap also fell Rs 100/100kg to reach Rs 11000. In Delhi metal market, Aluminium Wire Scrap and Aluminium Utensils Scrap remained unchanged. Copper Mixed Scrap went down by Rs 0.50/kg to reach Rs 442.5/kg. we are a loading scrap company in UAE, please contact us for any kind of scrap you want.